1 year, 375 posts, countless hours of tapping away at a keyboard and over 125,000 hits later, In a nutshell has cupped its hand around the coal of the blogosphere and has ignited a passion that, I can safely say, none of us ever expected. A year ago today, the five us sat together with newly found enlightenment as we picked away and plucked up the exactly perfect words to describe who we were and what our blog encompassed. The birth of our blog and the coming together of its contributors was an organic process and before we knew it, we had a beautiful outlet of creativity at our fingertips, allowing us to connect with each other and with other women across the country. 1 year later, we have taken the time to reflect upon this amazing year and acknowledge those who have helped us along this incredible journey. Below, our five contributors have dedicated a few paragraphs to our little blog that could, mentioning the people that inspire us, the people who have encouraged us and most importantly, the people who have followed our blog as dedicated and avid readers. We thank you for your constant and cherished support. In a nutshell, well, we couldn’t have done it without you. When we started inanutshell, I was so excited to be writing content that wasn’t academic as part of my studies. Fast forward a year later and I can safely say that even though Grad School kept me insanely busy, the time I scheduled to work on content for this blog kept me sane. Not only has it been a wonderful way to collaborate with some of the most incredible friends that I have, but it’s also been an avenue that has allowed me to explore myself. No one, including myself, knew about my affinity for cooking, baking, crafting and DIY-ing. This new Betty Crocker/Martha Stewart side has been really fun to explore and has made me feel good about a whole new realm of talent that I possess…who knew!? On top of that, I’ve been so happy to collaborate with The Body Shop Canada. The company is one of my favourites for a few reasons, but their values and ethics as well as top notch products make me happy to have them as one of our sponsors. On top of my personal highlights, my co-founders and inanutshell as a whole makes me so proud. In just one short year we have received so much positive feedback from friends, family, acquaintances, and even strangers, with local musicians, artists, businesses and events reaching out to us for collaborations. What began as a small blog to unite best friends has turned into a much larger entity that I’m proud to share with the world. I can’t predict the future, but I have faith that this is only the beginning for our little blog that could. Ellen, here we come! It seemed impossible to put into words who we were and what we wanted to do with all of this. This bond – unbreakable over distances and years and unique in every way – was about to be strengthened by daily doses of each other’s thoughts and nurtured by the comfort that we were about to set up a place for ourselves where we could always meet and be on the same page. About 45 minutes after the last sip of our drinks and a few pats on the back later, that page became In A Nutshell. I couldn’t be prouder of the year we’ve had with this. Our classic, laugh-filled hangouts became energized with article ideas, interviews, photos and documentation to put into our newfound endeavour. Cities changed and circumstances shifted, but one thing has remained the same – we are a group of best friends budding with stories, respectful of each other’s thoughts and so excited to engage in a conversation with other women. Throughout the past year, we’ve made so many new friends; so many people willing to chat with us because something they read sparked their interest. What could be better than that? Meeting new people might just be my favourite thing on earth, and that has been one of the best parts of Nutshell. Behind the scenes scoop? It isn’t always easy. Anyone who writes, and tries to write at least a little well, knows that it takes time. Between the fruition of an article idea, into the exploration process and then the actual writing – these babies don’t come together in a flash. But we love it, and that’s why it does come together at all. At the end of the day, it’s been the chance to participate in an even more ongoing discussion/banter with four of my best friends. Disagreeing, agreeing, howling with laughter and experimenting are some of the best parts of friendship – and there’s been no shortage of any of it. Outside of that – delicious meals, music festivals, beautiful birthday celebrations, contests, adventures and further insight into what these silly other nuts are always thinking have been some delicious cherries on top. I foresee a lot of changes, because with reader feedback and our own growing passion for words and stories, there’s no way we’ll stay put where we are. Anything we can do to stay connected with each other and with everyone else seems like the only path. So, here’s to the next chapter, one that is even weirder, funnier, more heartwarming, and undoubtedly more nuts. Thanks for sticking with us! We all love hanging with our girlfriends…shopping, sipping coffee, getting ready for a night out, grabbing a cocktail, traveling… But I have to say that there’s no better feeling than creating something truly unique, just for the fun of it, with the women that make you laugh the most in the world. It’s an incredible experience to share a dot com (or dot ca, rather) with those you most trust, adore and respect. In a nutshell has not only given us that place, but it’s surely taught us all quite a bit about friendship, creativity, and of course, the wonderful world of scheduling. I’m most thankful to the ladies I feel honored to know, who have covered for me relentlessly, taught me so much along the way, and continually impress me with their expertise. Catherine, your writing abilities astound me – every single intro you write entices otherwise disinterested visitors to read on, and consequently, become instant fans of your work. Meghan, your capacity to jump from Body Shop product reviews to important, controversial topics makes me believe that you were born to write for a blog like ours – and you make me laugh from my desk chair uncontrollably. Kate, I often find myself thinking that your posts belong in their very own section, which Ottawa natives and tourists alike, will flock to for the best advice. You have such a knack for seeking out must-see venues, and telling us just what we need to do/drink/order, in a way that is never dull, and always intriguing. Jess, your writing consistently seems fit for a magazine, and I continually get drawn in to your genius use of wording and phrasing. Your infinite knowledge of music is astounding, it continues to impress me with each day I know you. If nothing else, in a nutshell has given me the chance to stay connected with a group of ladies who are incredibly dear to my heart. I’m so looking forward to the next stages of our lives. We are so grateful for the love and support of our families, friends and anonymous readers. We hope to transform and grow with you all through this little idea with limitless potential, and many more adventures to come (in a long-winded, babbling, gushy, nutshell). It sounds cliché, but it always catches me off guard how fast a year can fly by. It feels like just yesterday we sat, caesar’s in hand, in Kaylee’s Montreal living room, trying to come up with the most perfect and eloquent paragraph for our “About Us” page on our newest endeavor – inanutshell. I think I can speak for everyone when I say, a year later, that the result is something even more special than any of us imagined. There’s a very unique kind of pride that comes with seeing your friends – people you’ve known for months, years, decades – blow you away with something they’ve written. I always find Kaylee knows how to say things perfectly. Whether she’s detailing outfits I could never put together on my own, or giving an important piece of advice, her words always jump off the page in a way that is somehow as sweet as she is in real life. I’ve always known Kate to be an exceptional writer. But, it’s her creativity, her knowledge in subjects I don’t know a thing about (wine!) and the way she all packages it in an easy-to-read way, that makes me have a new appreciation for her with each new post. Meghan’s wit is unmatched and if you’ve ever read one of her humourous posts, that’s plain to see. But, the most interesting part about this hilarious woman, is that she is brilliant, passionate and informed on serious and important topics. Half comedian, half academic, her additions to our blog are so unique. And finally, with Jess’s posts you can tell that writing is not a hobby or something she’s discovered recently. It’s evident with every new piece – about a new band, nutrition tip or tale from a new city – that she takes a certain pride in putting words together perfectly, in a way that no one else can. I’ve learned a lot in a year.. That boys can love a “girls blog”. That people you’ve lost touch with can sometimes feel so close. That you CAN and WILL write a post in under twenty minutes if you’ve misread the schedule. That people love to hate the Bachelor as much as I do. And that sometimes, judgment can come as quickly as praise. I always knew I loved writing, being creative and being able to put those things that are sometimes hard to say into words, to share with those I care about. But, even more than that, I know I love the four other ladies behind this blog. I love that no matter where we are – Ottawa, Toronto, Montreal … Europe – we have something that connects us. A common goal, a shared passion and a perfect excuse to talk, plan and appreciate each other, everyday. So thank you brilliant co-contributors, thank you devoted readers and most of all thank you inanutshell for being something that threads me together with the most special women. My girls. After reading through each individual acknowledgment, I had to figure out where to begin in my own dedication to inanutshell.ca. It quickly became apparent, as I’m sure it has to you by now, that a lot of our inspiration for our blog stems from one another. To me, that is the beauty of inanutshell. Our blog has budded into a space for creativity and new ideas, but it has also acted as a constant reflection of respect and admiration from one contributor to another. We all have so much respect for each other, and for the wealth of information that each of us possess. I believe that our relationships as friends, bussiness partners and as writers fuels the fire of this blog and has molded it into what we have today. It is the organic dynamic of five friends who each have so much to say, but in so many different words that makes inanutshell unique. Aside from drawing strength and inspiration from one another, there are many people who have either contributed to our blog or endlessly supported our efforts and those special people cannot go unnoticed. Our parents have all supported us to no end, and have encouraged our dream of creating a blog that could act as a home base for women of all backgrounds and interest. My mother has played a huge role in supporting inanutshell from simply liking posts on Facebook, to calling me up to suggest a more suitable string of words to fill in here or there. My boyfriend has also been monumental in supporting this blog. He has been the hand behind many photographs as well as the one to lend an ear as I orally pour over the last few lines I’ve typed. Just like any endeavor, the future of inanutshell holds great opportunity. Two of our contributors have recently relocated to the big smoke and will constantly be hitting the pavement to keep up with the Toronto beat. Meanwhile, Catherine, Meghan and myself will make the rounds of our home base in Ottawa, always seeking new opportunities to expand our readership and to allow our blog to flourish. As a reader, we hope you take any opportunity you see to make suggestions to better our blog; our posts are written for your enjoyment and we hope to continue publishing content that will inspire you, or at least bring a smile to your face. With that said, it has been a wild ride, with some unexpected peaks in our career as bloggers. This experience has been one of personal growth, allowing me to learn things about myself and my strengths that I was previously unaware of. 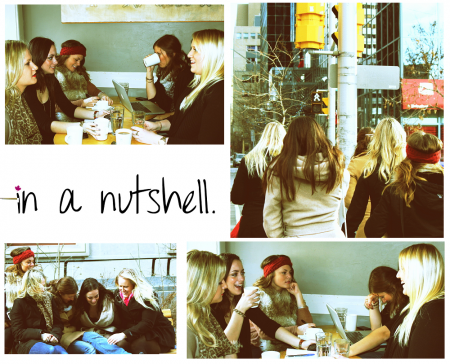 And, in a nutshell, writing alongside with four other very talented women has made inanutshell.ca a precious part of my life as a young woman. Has it already been a year? I have read every article, I’ve laughed and cried, but most of all I must say that I am incredibly proud of these 5 young women (that are friends forever – a priceless gift), create something that is of real value. Makes me feel warm inside knowing that the future is the hands of this next generation……can’t wait to see what each of you will write/do/achieve next……bravo!! Happy birthday Nutshell!!!! I love this blog and wanted to say thanks to you for all the hours of work you’ve each put in! I read it every morning with my breakfast and now couldn’t imagine what I was doing a year ago without it! Together you guys have created a truly amazing blog and you each deserve a huge pat on the back (or a biiiiiiiiig caesar!!) haha Congrats again!